Think the look of real-wood window blinds are out of your reach? Faux-get about it! 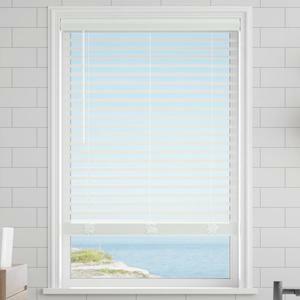 Now you can get the classic look of wood at a budget-friendly price with our Classic 2” Cordless Faux Wood Blinds. But don’t think just because they’re budget-friendly that they’re cheap looking. Au contraire. These stylish, completely cordless faux window coverings feature 2-inch-wide slats that let in lots of light when opened. They come in designer-favorite White or Off White, so they make the perfect, neutral backdrop for any space. And with an attractive 2-1/2” valance, they frame your window with a quality finished, seamless appearance any DIYer will appreciate. Made from durable, lightweight PVC, they’re easy to clean and super-simple to install. 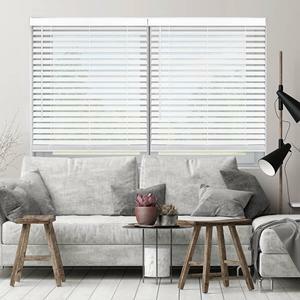 Best of all, these economical cordless faux wood window treatments are Certified Best for Kids, so you won’t have to worry about young children or pets getting caught in dangling, unsightly cords. Raise and lower them smoothly with the palm of your hand, and open and close the slats easily with the attached wand tilt. Blinds comes standard with tilt wand on left side. Wand length comes standard at 21". Valance, tilt wand, headrail and bottom rail come color coordinated to color selection. Blinds height made in 6” increments (36”-84”) and may arrive with 1-3 extra slats for guaranteed coverage and smoother operation. Great quality, easy to install for a 67 year old grandma, couldn't be more pleased. Ordered the 2” faux wood blinds in white. They fit my oddly-sized window exactly and they look beautiful. My husband installed them easily and quickly. They feel well made, go up and down, and twist open and closed smoothly. Couldn’t be more pleased!